Heading to Shaq’s Fun House this Friday, February 1st at Live! At The Battery? “Part music festival, part carnival, part circus,” don’t miss gourmet bites from culinary hotspot STK. In honor of the Big Game, STK’s Atlanta location in the heart of Midtown will feature an STK Shaq’s Fun House special from Thursday through Sunday. 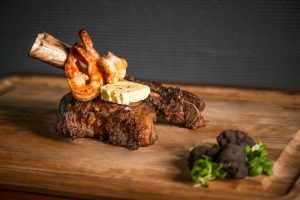 Locals and visitors alike are invited to sink their teeth into a Dry-Aged Tomahawk steak, topped with Truffle Butter, and Three Shrimp, available for $145. STK  is a unique concept that artfully blends the modern steakhouse and chic lounge  into one, offering a dynamic, fine dining experience  with the superior quality  of a traditional steakhouse. STK distinguishes itself by focusing on the social  experience with a sleek,  contemporary design and an in-house DJ who creates an  infectious, high-energy vibe. The menu features reimagined classic American  cuisine with signature dishes like bite-sized Lil’ BRGs made with Wagyu beef,  Lobster Mac & Cheese and, of course, the highest quality steak. STK defines  the modern fine dining experience with incredible food, world-class service and  the perfect atmosphere. For more information, on Shaq’s Fun House, visit https://shaqsfunhouse.com/. For more information about STK, please visit  www.stkhouse.com.